Stems erect, coarse, 50-150 cm. Leaves cauline, proximal leaves petiolate, distal sessile; petioles and rachises stipitate-glandular to glabrous. Leaf blade 1-4×-ternately compound; leaflets grayish or brownish green or dark to bright green, lanceolate, elliptic, ovate, reniform to obovate, apically undivided or 2-3(-5)-lobed, 9-60 × 5-50 mm, length 0.9-2.7(-5.25) times width, usually leathery, margins often revolute, lobe margins entire; surfaces abaxially with sessile to stalked glands or muriculate to whitish papillose. Inflorescences racemes to panicles, elongate, many flowered; peduncles and pedicels sometimes stipitate-glandular. Flowers usually unisexual, staminate and pistillate on different plants; sepals 4(-6), whitish, ovate to oblanceolate, (2-)3-4 mm; filaments white, slightly clavate, 2.5-7.8 mm, ± flexible; anthers (0.7-)1.2-2.7(-3) mm, blunt to apiculate. Achenes 8-16, sessile or slightly stipitate; stipe 0.2-1.7 mm; body lanceolate to ellipsoid, 3.5-5 mm, prominently veined, usually stipitate-glandular; beak ± persistent, linear-filiform, (1-)1.5-3.3(-5) mm, ± equal to length of achene body. 2 n = 140. Flowering spring-summer (Mar-Jul). Dry open woods, brushy banks, thickets, barrens, and prairies; 30-2000 m; Man., Ont., Que. ; Ala., Ariz., Ark., Colo., Conn., Del., D.C., Fla., Ga., Ill., Ind., Iowa, Ky., La., Md., Mass., Mich., Minn., Miss., Mo., Nev., N.J., N.Mex., N.Y., N.C., Ohio, Okla., Pa., R.I., S.C., S.Dak., Tenn., Tex., Vt., Va., W.Va., Wis., Wyo. 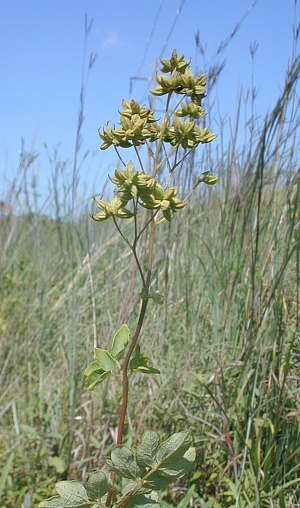 Glandular individuals of Thalictrum revolutum have been called var. glandulosior . They are seen throughout the range of the species and do not represent a distinct lineage. Occasional glandular plants with unusually short anthers are often misidentified as T . pubescens . Material of this species from the western United States has been incorrectly assumed by previous authors to be T . dasycarpum , because T . revolutum is not included in floras of that region. Infrequent to frequent throughout the state in moist soil. A form with yellow roots (when collected) is generally found in dry soil on wooded slopes and less often in moist, sandy places. I think the form, which usually has only sessile glands, should be separated as a species or variety. It may be that it is Greene's Thalictrum amabilis, the type of which I have not seen. I have 70 sheets of this species from Indiana and I have failed to make a record of the color of the roots of many specimens but I think that I made a record when the color was yellow and did not when no color was evident. Plants stout, odorous, 1-2 m; lfls variable in shape and size, mostly subcoriaceous and prominently reticulate-veiny beneath, narrowly revolute, finely pubescent beneath with short, capitate-glandular hairs (rarely glabrous and glaucous); filaments capillary or slightly dilated above; anthers 1.8-2.7 mm; stigmas 2-3.5 mm; achenes ellipsoid or lanceolate, 4-6 mm, usually minutely glandular- hairy; 2n=ca 134. Dry woods and prairies; Mass. to s. Ont., O., Ill., and Mo., s. to Fla., Ala., and Ark. June-July.